THIS ROUTE IS NO LONGER IN PRODUCTION! The route is a fictional route; based on lines in the Yorkshire dales. All the places in the route really exists though not one ever had a rail service. All the locations are within a 10 mile radius of Hebden Bridge; which still has a Rail service. At the moment, the route is designed for a stopping train, currently a Class 37 and 6MK 1s, although I'd like to use the 116 when ready. The route is 28� Miles long, and takes around 50mins - 1 hour to traverse. The line is mostly single track althogh the last 5+ miles are double. There are a couple of branchs brake away. The line is currently setup as 1989, and so the other trains represent this period. Version 1.14 is out with testers. 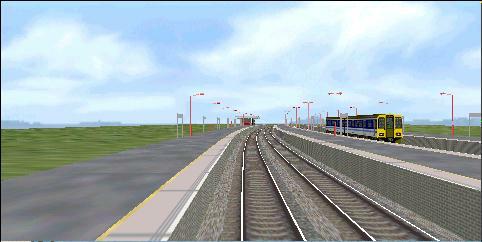 New features include 2 more variations of RGT, and a rebuilt Cornholme station - now a junction. I will be uploading some screenshots in due course. Version 1.12 is ready for the beta testers. New features include the odd semaphore, more buildings etc... However, there is more exciting news! Demo Version 1.02 is now ready for you to play! Visit the downloads page now. Version 1.11 is now with testers... New features include RGT applied as far as Clough Foot, a siding at Lumbutts, more rivers, and a few more objects. The DEMO short section is now closer than ever I just have to add some more objects at Heptonstall. Latest version sees the introduction of RGT - Rolling ground technique. This adds to the bleak and baron landscape effect. Screenshots will be posted very soon. I'm hoping to get a DEMO version out, which would feature the slowest part of the line from Lumbutts - Clough Foot. This should appear by the end of next week. 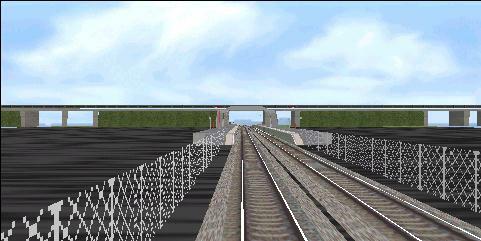 Newest version features yet more embankments, and objects. An alternate 1989 summer saturday timetable is being formulated, traction currently a EE Class 20. I'm hoping to get a small section of route fully ready for Release soon. Current Alpha testing version (#1.07, not available to general BVE users) now contains many more embankments; cuttings and landscape features. More trains have also been added. New ones at the top, some screenshots are deleted after a while but you can still view them by going into the directory /Images if you really must! The Station building from Cornholme - you won't see this in the finished route yet. This is a referbished version ready for the 1990s routes!